This and succeeding sections discuss methods and implements for physically removing weeds from crops. Most of these implements act by cutting or uprooting the weeds with tools that disturb the soil. These implements are commonly referred to as cultivators. In addition to this large class of implements, thermal and electric weeders damage weed tissues by a discharge of heat, cold, or electricity. The most common of these are the various types of flame weeders. Other implements include weed pullers and mowers. All these implements may be classified according to where they work relative to the crop row. Inter-row cultivators remove weeds from the area between crop rows. In contrast, in-row weeders specifically attack weeds in the crop row. Near-row cultivators and weeders may or may not affect weeds in the inter-row, but are able to harm weeds closer to the crop row than is commonly the case for most inter-row cultivators. Finally, some machines act similarly on both the in-row and inter-row areas, and these are referred to here as full-field machines. Full-field cultivators are usually used prior to or just after crop emergence. The most difficult weeds to remove with cultivators and other types of weeders are those that establish close to crop plants. Consequently, much of the discussion will focus on implements that are effective against weeds in and near the crop row. Although this and succeeding sections focus on machine-powered implements, most of the principles governing cultivation apply equally to hand and animal-powered tools. Also, many of the implements discussed in the following sections, including inter-row sweep and shovel cultivators, rolling cultivators, basket weeders, and weeding harrows, have hand and animal-powered analogs (Intermediate Technology Publications, 1985, pp. 12-55; Alstrom, 1990, pp. 98-131). Moreover, most in-row and near-row weeding tools are simple, low-draught machines that could easily be mounted on an animal-pulled toolbar. The low speed and fine position control possible with an animal-drawn implement is ideal for these tools, and they could potentially reduce some of the most arduous labor in the smallholder cropping cycle. Even small increases in mechanization, such as a shift from hand hoeing to use of a push weeder, greatly decrease weeding time (Tewari, Datta & Murthy, 1993), thereby improving the timeliness of weeding and crop yields. Mechanical weeding is guided by several simple principles. 1. Row-oriented cultivators should work the same number of rows as the planter, or a simple fraction of this number. Otherwise, imperfect spacing between adjacent planter passes will lead to improper placement of tools relative to some rows, with consequent damage to the crop and poor control of weeds in the inter-row. 2. The action of the cultivator must be appropriate for the growth stages of the weeds and crop. The timing and number of cultivations required depend on the growth rate of the target species and the size range over which it is susceptible to the implement. Based on many years of farming experience, Bender (1994, pp. 35-7) suggested that staggered planting of crops facilitates timely cultivation by reducing bottlenecks due to weather. The degree to which precise timing is critical depends on how closely the implement works to the crop row. In-row weeders and full-field implements cannot dig deeply without damaging the crop. For these machines, operations must be timed to catch the weeds after they have germinated but before they become well rooted, and delaying cultivation may allow many to escape (VanGessel et al., 1998; Fogelberg & Dock Gustavsson, 1999). Implements that work close to, but not in, the row have a larger window within which the work can be performed, but still require careful attention to timing. In contrast, timing is less critical with most inter-row cultivators. For example, Mt. Pleasant & Burt (1994) found that timing of cultivation with a shovel cultivator had little effect on either weed biomass or maize yield. 3. Creation and maintenance of a size differential between the crop and the weeds facilitates effective mechanical weed control. Most sophisticated mechanical weed management programs begin with a stale seedbed or pre-emergence cultivation to delay emergence of weeds relative to emergence of the crop. Full-field, in-row, and near-row weeding can then increase in depth and degree of soil movement as the crop grows larger. For many row crops (e.g., maize, sorghum, potato), once the crop is well established, soil can be thrown into the row to cover small weeds. However, because of the high growth rate of most agricultural weeds, this will only be effective if the first cohorts that germinate following crop planting have been killed previously. 1992; Schweizer, Westra & Lybecker, 1994; Eberlein et al., 1997). In contrast, if the initial density is moderate, the few that survive will cause little competitive stress in robust agronomic crops and can be cost-effectively hand rogued out of high-value crops. Second, soil clings better to a dense mass of roots than to individual strands of root. Consequently, rerooting is a bigger problem when weeds are dense. Finally, some implements do not penetrate well when roots bind the soil together and the soil surface is lubricated by green plant tissue. If perennial weeds are abundant in the field or the seed bank is thought to be high, steps should be taken prior to planting to reduce weed density, and the field should be rotated into a crop that will tolerate vigorous cultivation and hilling of soil about the stems. 5. Effective cultivation requires good tilth, careful seedbed preparation, and adequate soil drainage. Tilth is critical. Good tilth facilitates stripping soil from weed roots. It also reduces the probability of knocking over crop plants with clods when soil is thrown into the row. Moreover, shallowly working tools are relatively ineffective in cloddy soil because (i) seedlings of some species emerge from greater depth in cloddy soil (Cussans et al., 1996) and the tools cannot reach them without harming the crop, (ii) when clods are moved, seedlings emerge that otherwise could not reach the soil surface, and (iii) seedlings in clods may successfully establish after cultivation if rain or irrigation subsequently allows the clods to merge into the soil matrix (Mohler, Frisch & Mt. Pleasant, 1997). All these factors argue for practices that improve soil structure, including cover crops, manuring, rotation with sod crops, and controlling wheel traffic. They also argue for delaying tillage until soil moisture conditions are appropriate, even if this entails a delay in planting. Even in soil with good structure, clods will form if the seedbed preparation is inadequate to eliminate them. For many large-seeded crops, a coarse seedbed is not detrimental to establishment and may be beneficial in reducing erosion (Burwell & Larson, 1969). However, for the reasons mentioned above, it may be disadvantageous during cultivation. 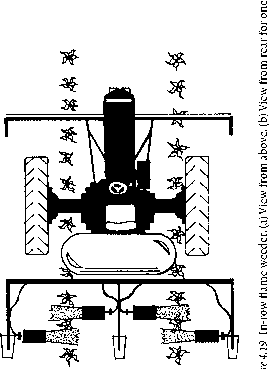 For shallowly working implements, a level seedbed facilitates depth control. For some, it is mandatory. Because timeliness is critical to the success of most in-row, near-row, and full-field cultivation, adequate soil drainage may make the difference between successful weed management and substantial crop loss. When storm events are following in close succession with short rain-free periods between, adequate tile drainage may allow cultivation on fields where it would otherwise be impossible. than cultivation in daylight. 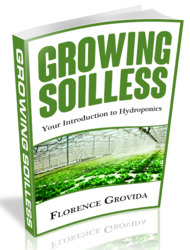 As explained in Chapter 2, light stimulates seed germination in many weed species. During cultivation or tillage, seeds may be exposed to a brief flash of light and then buried again. Consequently, tillage and cultivation at night, or with implements that are covered with light-excluding canopies, often results in lower weed densities (Hartmann & Nezadal, 1990; Ascard, 1994a; Scopel, Ballare & Radosevich, 1994; Botto et al., 1998; Gallagher & Cardina, 1998). 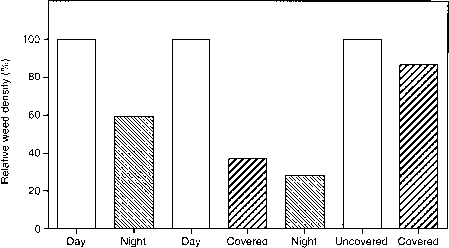 Buhler (1997) showed that dark tillage reduced densities of several small-seeded broadleaf weeds, but that it did not reduce densities of annual grasses or large-seeded broadleafs. Even for generally light-sensitive species, some seeds do not require light for germination, and others will end up near enough to the surface to satisfy their light requirement regardless of how or when the operation was performed. Consequently, dark cultivation only reduces, but does not eliminate, weed emergence. Variation in species composition, dormancy state of light-sensitive species, distribution of seeds in the soil column and degree of soil mixing probably all contribute to variation in the results of dark tillage experiments (Figure 4.10). With regard to soil mixing, Jensen (1995) demonstrated that density of Chenopodium album emerging after 0 to 16 harrowings in daylight increased monotonically over the full range of soil disturbance. In contrast, maximum emergence was reached with four harrowings when operations were performed in the dark. Presumably, when tillage was performed in daylight, additional seeds were exposed to a light flash with each operation. The optimum strategy for using light-sensitive weed germination may be to perform primary tillage in the light, wait for emergence, and then prepare and plant the final seedbed in the dark (Hartmann & Nezadal, 1990; Ascard, 1994«; Melander, 1998). So far, no studies have reported on the effectiveness of dark cultivation after planting. A possible strategy for post-planting cultivation would be to perform shallow full-field cultivations in the dark to minimize weeds in the crop row. Early inter-row cultivation could then be done in the light to help clean out the seed bank, since usually 100% of young weeds in the inter-row can be killed by subsequent operations. The final cultivation would then be done in the dark or with light-shielded equipment to minimize further emergence. 7. Attentive timing relative to changing weather and soil conditions can improve the effectiveness of cultivation. Rotary hoes are ineffective when the ground is too wet (Lovely, Weber & Staniforth, 1958). Flame weeders work best when leaf surfaces are dry (Parish, 1990). Most cultivators are more effective during hot dry weather since, under these conditions, uprooted weeds desiccate quickly without rerooting (Terpstra & Kouwenhoven, 1981). Thus, planning cultivation with the weather forecast in mind frequently improves results.